On Monday, the highly respected English language newspaper The Cambodia Daily, under pressure from the government to shut down, published its last edition. The front page led with a photo of Cambodia’s opposition leader, Kem Sokha, being escorted into detention by police after his arrest on Sunday. The two events augur terribly for the country and are an acceleration of Prime Minister Hun Sen's efforts (previously noted here and here) to silence opposition and ensure victory at next year’s general election. The Cambodia Daily, founded in 1993, had a reputation for independence in an otherwise restricted media landscape. Despite a small circulation, it had a strong following among a select elite as well as the expatriate community. It had other strengths as well: a regular supplement was used as an English learning tool in local schools and the newspaper has been an incubator for young Cambodian and foreign journalists in the country. On Monday, the tax department issued a notice that bans the newspaper’s publishers from leaving the country until they pay a US$6.3 million tax bill. The Daily said the figure was astronomical and reported the government had not audited or reviewed the newspaper’s accounts. The newspaper's founder, American Bernard Krishner, once noted that former Cambodian ruler Prince Norodom Sihanouk had regarded the newspaper as his 'CIA,' offering independent information on what was happening around the country. Perhaps, for a time, it had served a similar purpose for Hun Sen. Today, much of the intel function played by the Daily can be found on social media. Press freedom in Cambodia has eroded steadily over the past decade, according to Freedom House rankings. From being judged 'partly free' with a press freedom score of 58/100 in 2007, it is now in the 'not free' category, sliding 12 points this year. As well as The Cambodia Daily closure, last month some 18 radio stations were told to cease broadcasting. Local broadcasts of the US-backed Voice of America and Radio Free Asia were among those ordered to stop. Coupled with the crushing of press freedom is the detention and continued threats against those who oppose the government. The arrest of opposition leader Kem Sokha for treason - he is accused of conspiring with the US - is a death knell for democracy in Hun Sen’s Cambodia. Kem Sokha took over the leadership of the Cambodian National Rescue Party in February after high profile opposition leader Sam Rainsy resigned and went into exile. At the time, many analysts thought Kem Sokha would provide a more robust opposition to the government. This was borne out by the party’s strong showing at the commune elections. While the ruling party was the overall victor, the opposition increased the number communes it controls from 40 to 471. But Kem Sokha’s task was always an up-hill and perilous battle. His arrest is in breach of his parliamentary immunity and his detention in the notorious CC3 prison without immediate access to lawyers is a clear and intimidating signal that no one is out of reach. Neither event is unforeseen. Hun Sen’s bellicose and often bizarre rhetoric has taken a hostile turn since his party only narrowly won re-election in 2013. In June he warned his opponents to 'prepare coffins' ahead of the elections. He warned the military, under his command, would 'crack down on all movements that would topple [the government] and damage the nation'. He said he was prepared to 'eliminate 100 or 200 people' to ensure peace and declared 'war will happen; if his party loses next year’s July 29 general election'. For Hun Sen, 2017 has become a slide into dictatorship. Public enemy number one is the US. In January, Cambodia cancelled the annual US-Cambodia Angkor Sentinel military exercise, a month after the joint China-Cambodia Golden Dragon military exercise. In April, Hun Sen admonished Washington over suggestions that Cambodia should pay back a US$500 million debt. This came after a run of state-backed media stories seemingly designed to raise national ire against the US. Last month, Cambodia shut down the American and pro-democracy NGO the National Democratic Institute. As US Ambassador to Cambodia William Heidt noted in February 'from time to time, for reasons I don't think that we really fully understand, the Cambodian government feels the need to publicly criticise the United States…I think that reflects some kind of political dynamic inside of Cambodia'. The shut down of The Cambodia Daily is unlikely to quell dissent. Indeed, it could prove to be a case of better-the-devil-you-know for Hun Sen with new online versions and word of mouth dissent almost certain to emerge in coming weeks and months. But the closure of the newspaper does silence an important and progressive voice. Coupled with the arrest of Kem Sokha and last year’s political assassination of government critic Kem Ley, it firmly establishes a climate of fear. In late 2015, Hun Sen reminded his opponents they could be identified online, warning social media users that 'If I want to get you, I need less than seven hours'. Many of his political opponents will this week be in hiding. And yet Cambodia's retreat from democracy is low on the list of priorities for other nations in the region. With the chaos of a nuclear test in North Korea, a devastating and deteriorating situation in Myanmar’s Rakhine state, a long-drawn out battle against Islamic State-inspired militants in Marawi in the Philippines, and other situations summed up here, Cambodia’s despotic slide will likely be pushed down the priority list by many foreign desks. It shouldn’t be. 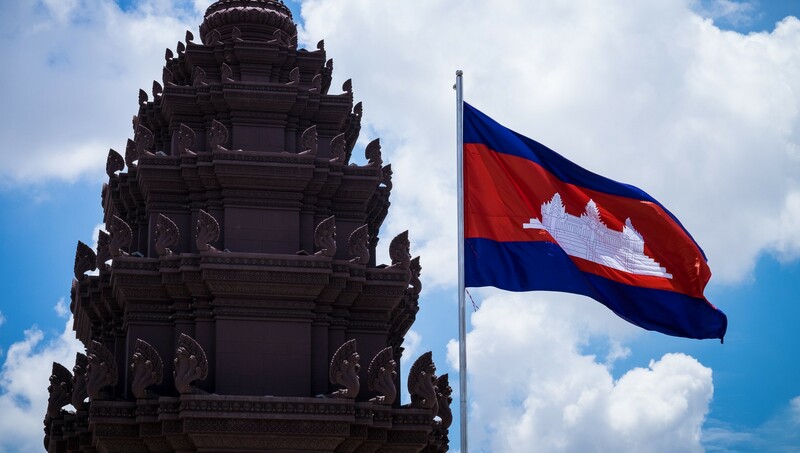 'Australia,' as Kem Sokha’s daughter Monovithya Kem noted, 'has a big role to play…given that many ruling party people use it as their base outside of Cambodia'.